On any given day in our house you’re likely to find piles of laundry, kitchen counters with food dried on them, cat and dog hair gathered in the corners of the common rooms and dirty dishes piled in the sink. It’s not pretty, but it’s our life. Two growing boys, two working parents, and a multitude of furry pets does not always an idyllic household make. I’d like to tell you that I have a cleaning scheduled that I adhere to, and that my children are conscientious about picking up after themselves and putting their dirty clothes in the hamper regularly (rather than tossing their dirty socks haphazardly in the air, allowing them to land wherever they may). I’d like to appear to have it all together, but that would be a lie. The truth is, sometimes I’m a mess. I stress out when I know people are coming over, worried that they’re going to judge me and my disorganized house. I long to be Mary Poppins – to just snap my fingers and have everything go back to its rightful place. My mother used to joke that, as her only child, I was “practically perfect in every way.” Sadly, that description does not come with a magic carpet bag full of delightful tricks and the ability to sing your cares (and your cluttered play-rooms) away. I’ve come to realize, in my almost 40 years, that we all have our strengths. While some of us are excellent housekeepers; others of us are decidedly not. I, clearly, fall into the latter category. However, I am not completely devoid of domestic talents. I may not have the ability to decorate impeccably or organize seamlessly; but, by God, I can cook. 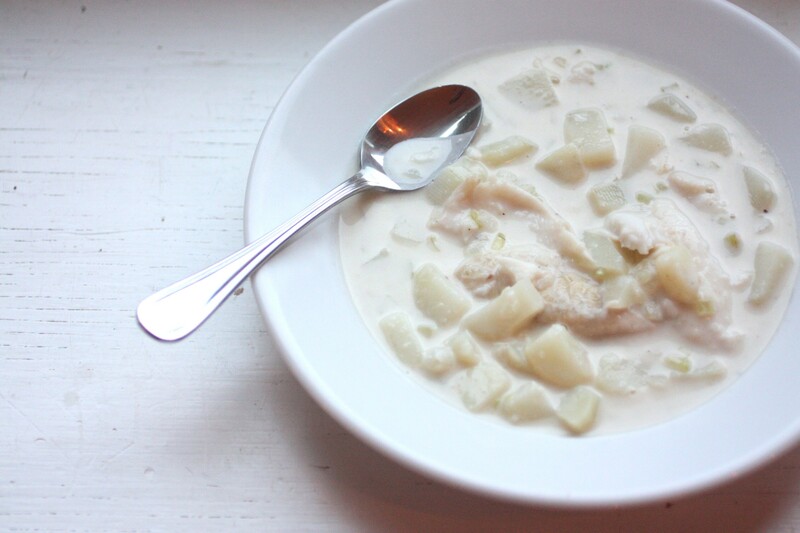 This fish chowder has found its way into regular rotation at our dinner table. 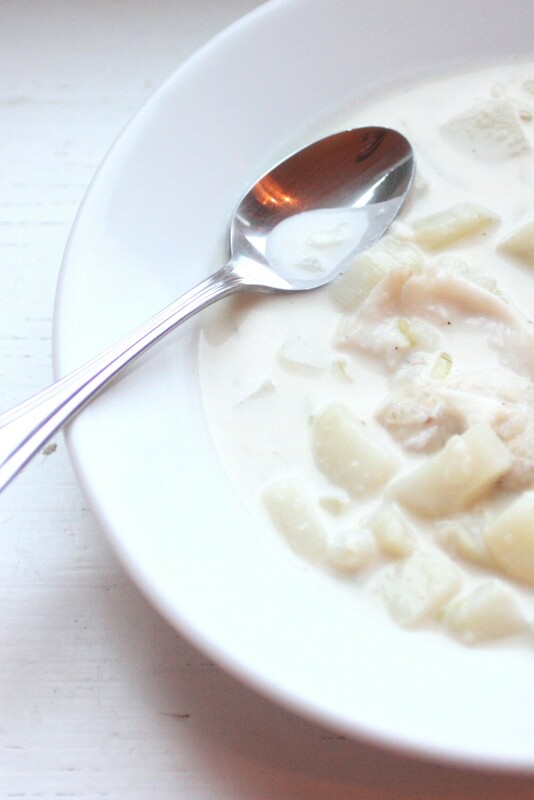 It’s super simple to put together, and the flavor is incredible. It’s adapted from this Martha Stewart recipe. I may not have all of Martha’s talents (or, rather, those of her staff), but I can certainly recognize a good recipe when I see one. Add the stock and stir to combine. Allow to come to a boil. Add the bay leaf and the potatoes and reduce to a simmer. Cover and cook for 10 minutes, or until potatoes are cooked through. Add the cream/milk and salt and pepper to taste. Listen, y’all. I know it’s been over a month since I last posted. It’s not like I haven’t been trying. I have at least three posts in various stages of completion that I just haven’t been able to bring myself to publish. I’m sorry. I guess I just haven’t felt like sharing much lately. Until tonight. 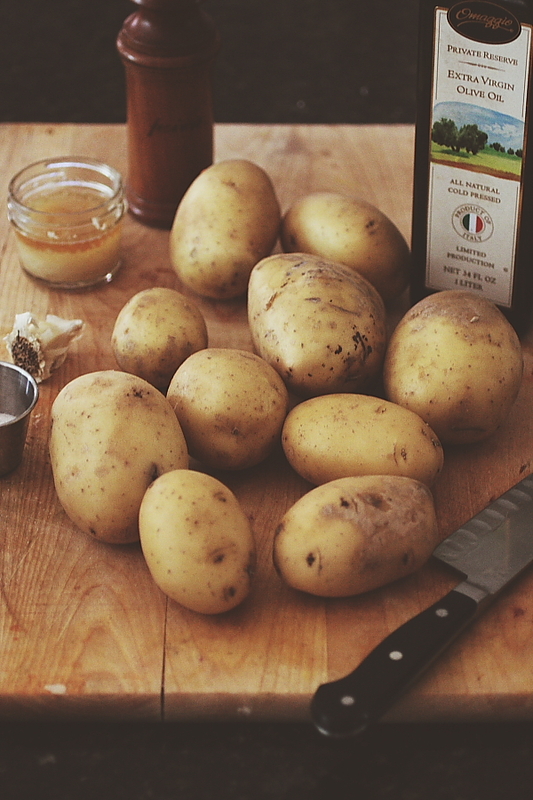 Tonight there were these potatoes. And I just knew that you’d want to know about them. Because after weeks of kitchen mediocrity and work-related anxiety, these potatoes arrived on the scene and changed the course of events for the better. It’s amazing how food can do that. It’s pretty simple, really. 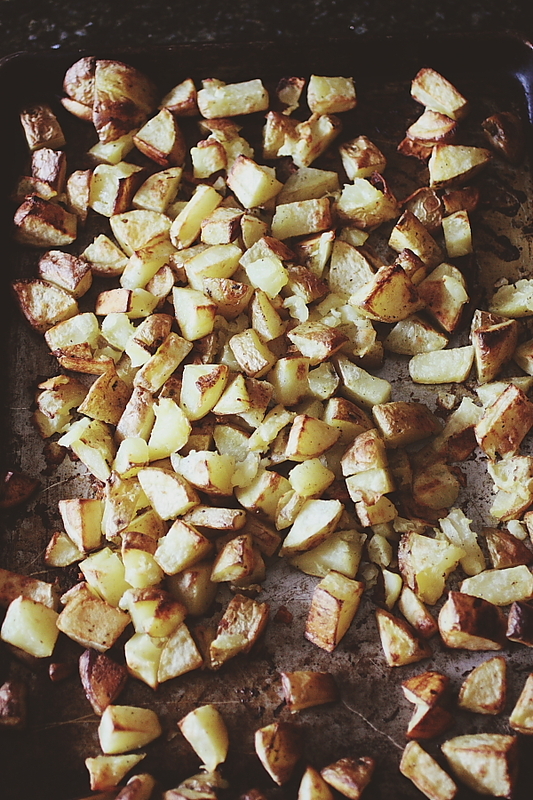 Golden potatoes, olive oil, garlic, salt, pepper and bacon grease. Yep – see that mini-mason jar in the top left-hand corner of the photo? That’s rendered bacon grease, leftover from the BLT’s we had for lunch yesterday. You know, the French are known for their potatoes cooked in duck fat (a distinction that is well deserved), so I figured here in the American South, we could use our humble equivalent – pig fat. If, however, you are averse to pork products, you could most certainly use all olive oil. It’s totally up to you. 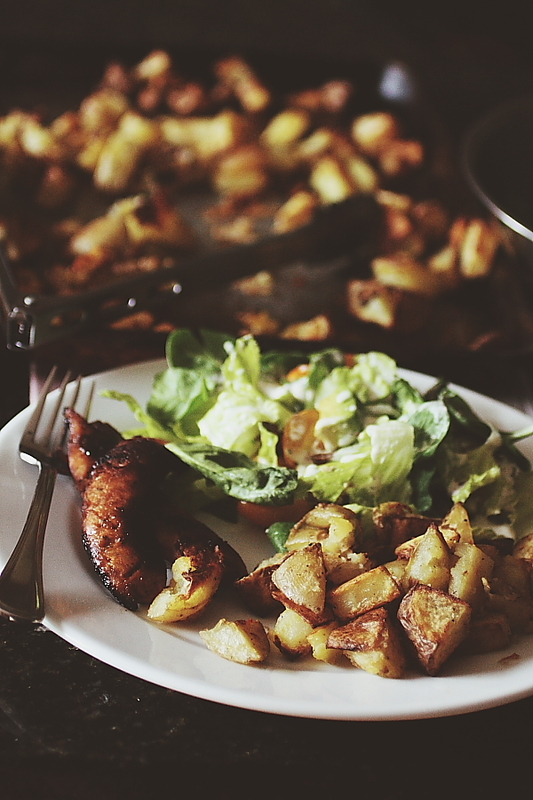 If you’re like me, though, and you relish the thought of bacon scented potatoes, then by all means read on. 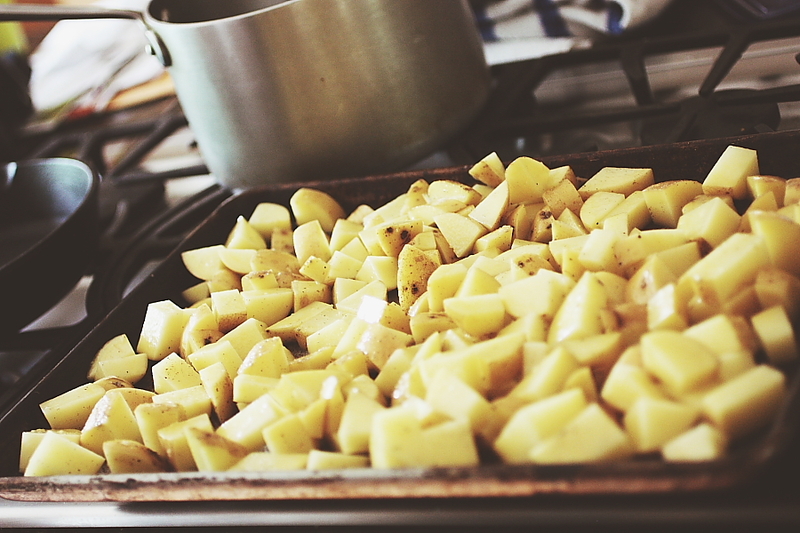 I start by preheating my oven to 450F, then scrubbing the potatoes and cutting them into 2-inch pieces. I then combine 2 tablespoons olive oil, 1 tablespoon bacon grease and 1 teaspoon grated garlic in another bowl, whisking to combine. This mixture then gets poured all over those potatoes. Add a teaspoon of salt and lots of freshly grated black pepper. 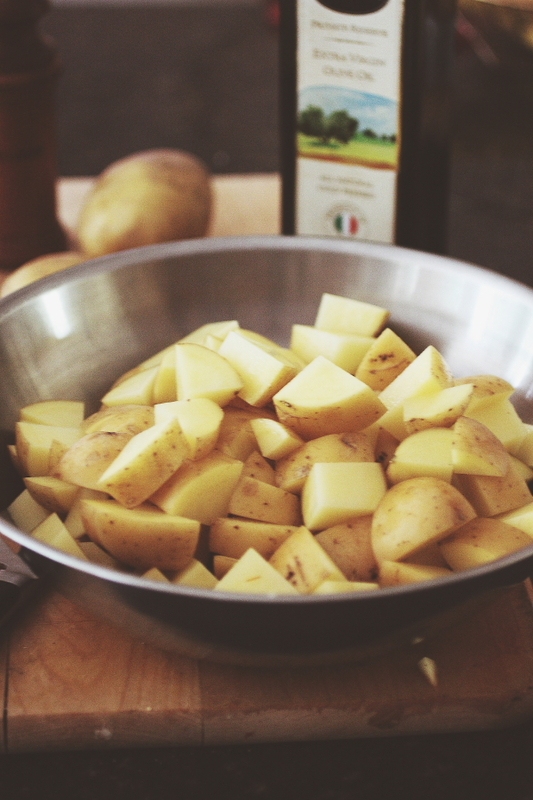 Pour the potatoes out onto a baking sheet, making sure you scrape every last bit of that delicious oil and bacon grease mixture out of the mixing bowl. Spread them into a single layer, and place them in your preheated oven. Bake for 45 minutes to an hour, checking periodically to make sure they’re not sticking. 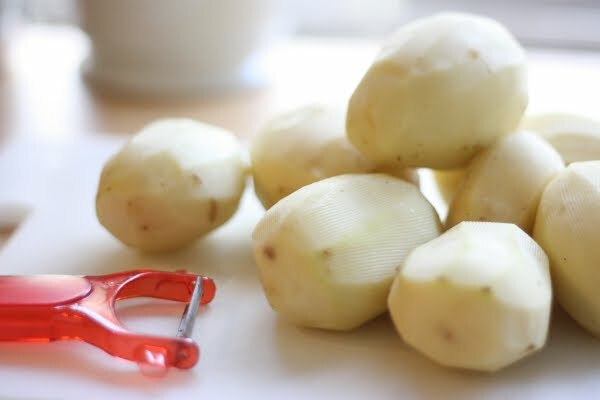 If they are, use some tongs to scrape the pan and loosen the potatoes – if they tear a bit, that’s okay – those torn bits get good and crispy and delicious. See, crispy and delicious. They’re addictive. I had to slap my husband’s hand out of the way as he stood at the kitchen counter eating them off the baking sheet (I might have had to practice a little self-restraint, too). I was afraid we wouldn’t have enough for dinner. 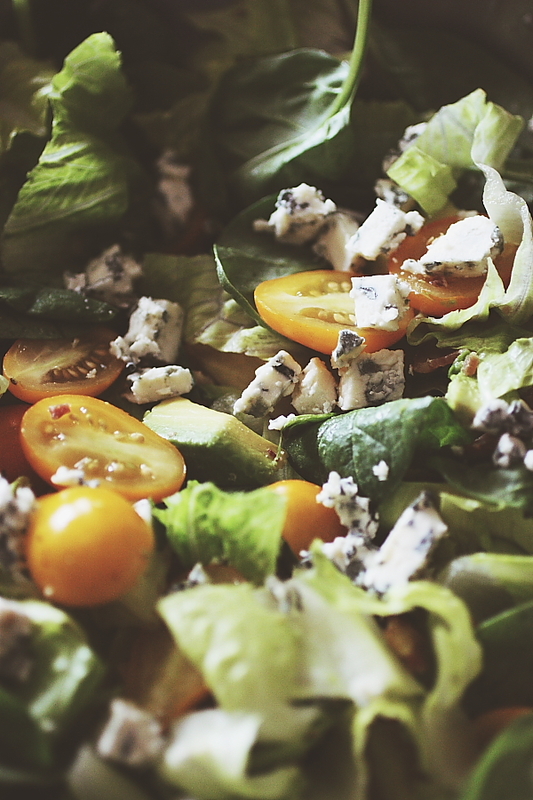 I served them alongside this salad – a combination of spinach, romaine, golden tomatoes, blue cheese and avocado – and some chicken sausage. 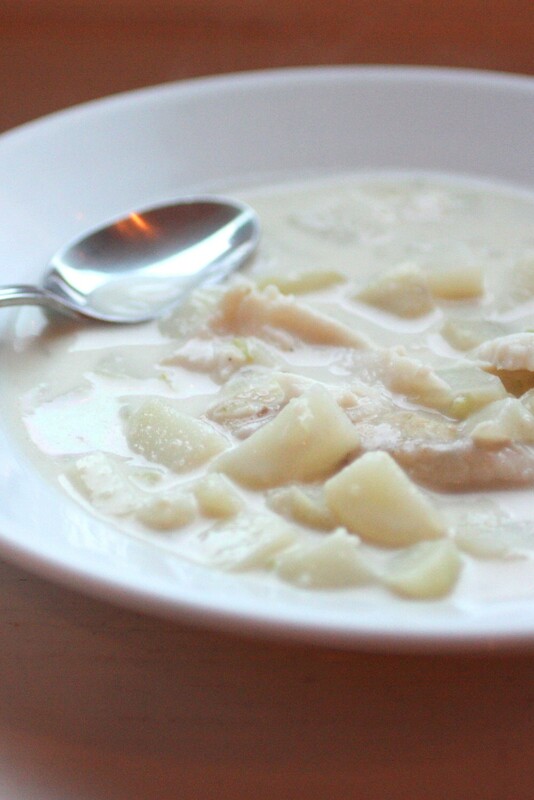 Even though it was a simple meal, it was one of the most flavorful we’ve had in a long time. And I wanted to share it with you. I’m a sucker for beautiful food photography, which is how I ended up with 3 or 4 cookbooks by Donna Hay. I was completely drawn in by the stunning photographs of Con Poulos, never considering that the recipes might be less than acceptable. Luckily, I have never been disappointed. 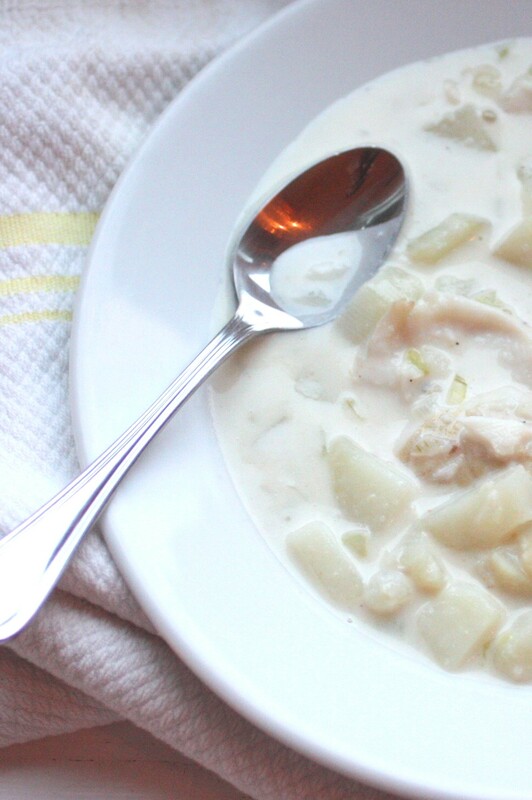 Today’s recipe comes from Ms. Hay’s Modern Classics, Book 1. 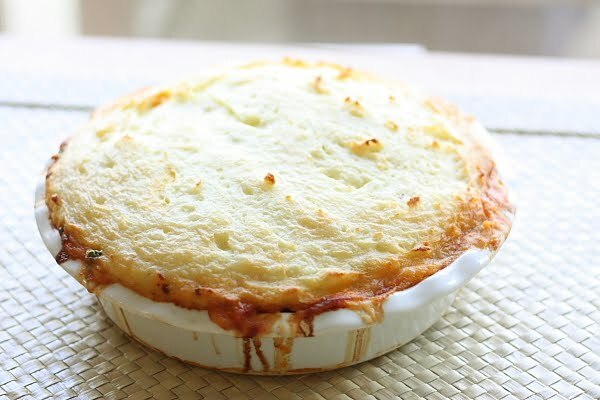 I love shepherd’s pie, and this recipe seemed simple and authentic enough. Start by peeling 2 lbs. of potatoes. Cut them into 1-2 inch pieces and boil in liberally salted water until fork tender. Mash with 1/4 cup milk, 2 1/2 oz. butter and 1/2 cup cheese (I used a dry sharp cheddar). Chop 2 medium carrots (or a couple of handsful of mini peeled carrots) and two small onions. Saute in 1 Tb. olive oil until tender. Add 20 oz. beef or lamb mince (a.k.a. 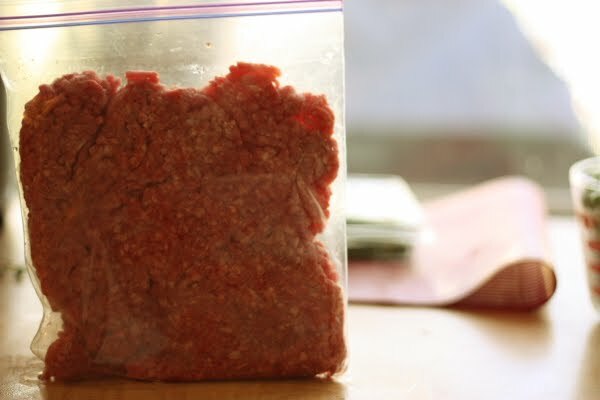 ground beef) and cook until browned. To this mixture add 2 Tb. tomato paste, 1 cup beef stock, 1 bay leaf, 1 sprig of thyme and 1 14 oz. can peeled tomatoes. Simmer, covered, for 15 minutes. 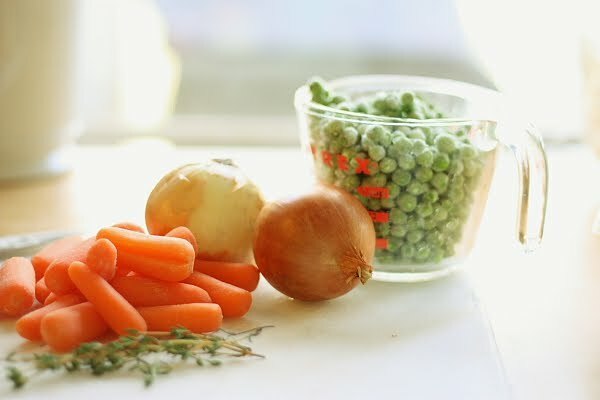 Uncover, add 1 cup frozen or fresh peas and simer 15 minutes more, or until most of the liquid has evaporated. 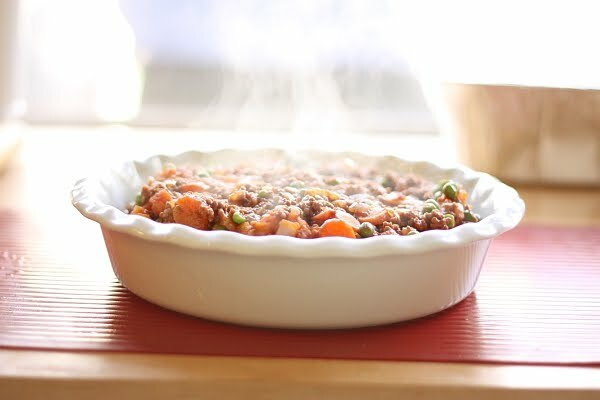 Pour meat mixture into a 4-cup baking dish. 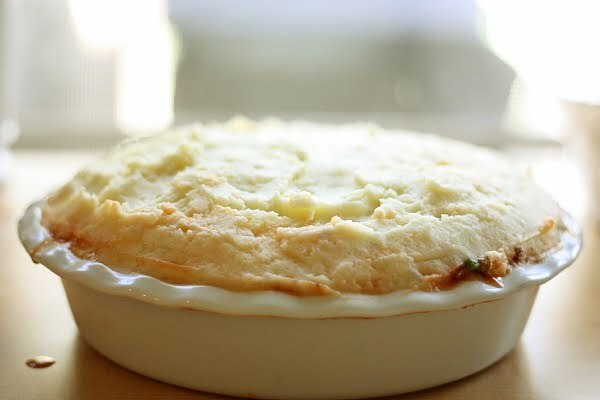 Cover with mashed potatoes and bake at 375F for 35 minutes, until potatoes have browned. Serves 4-6. Yesterday, before the sun had risen too high in the sky and pushed the temperatures into the stratosphere, I wandered down to the garden, toddler in tow. As the 18-month old chased the chickens (bock-bocks as he calls them) in and around the cypress trees, I examined the various plants to see if any were bearing fruit. Two of our ten tomato plants are laden with green orbs, and the two jalapeno bushes are weighted down with inch-and-a-half long pods. The butternut squash vines are in full bloom, and many of the blossom ends are beginning to swell with the promise of delicious golden flesh. Our infant asparagus patch has successfully gone to seed, and our cucumbers are rife with fuzzy little fingerlings. The lacy tops of the rainbow carrots are waving in the breeze, and the melons are creeping along the ground stealthily, their little yellow flowers smiling smugly in the sun.